If you enjoy Airspeed and the ethic that goes with it, you’ll probably enjoy some of these items. And, in addition to getting great stuff, you’ll be helping to fund your favorite aviation and aerospace podcast. Audible.com: Free Audiobook when you sign up for a free trial. Audible.com has more than 100,000 audiobooks of all kinds available for download and you can listen to them on almost any electronic device you can imagine. When you sign up for a free trial at http://audibletrial.com/AIRSPEED, you get a free audiobook of your choice and Audible sends a little money Airspeed’s way. You wouldn’t be listening to Airspeed if you didn’t love long-form narrative. So here’s your chance to get even more of the stuff you love and helping the show at the same time! 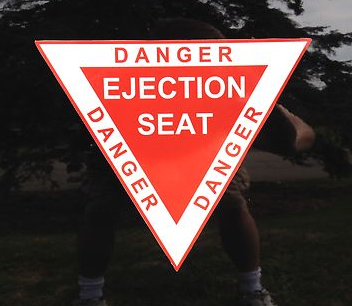 Ejection Seat Magnetic Novelty Decal. 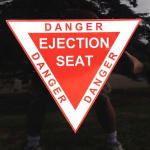 Check out an airspeed original: A magnetic ejection seat decal that turns even the most mundane grocery-getter into a BFM-capable instrument of destruction! Buy through eBay at http://www.ebay.com/itm/231034314686?item=231034314686&viewitem&vxp=mtr. $12 each plus $3.00 shipping for the first decal and $1.00 shipping for each additional decal. More descriptive information is available at the eBay listing. 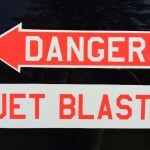 Danger – Jet Blast Magnetic Novelty Decal. Here’s another great way to make your car look like your jet. Decals that warn passers-by in the parking lot to steer clear of your afterburners. It’s a courtesy, really. If you’re going to throw Honda Civics arounf the parking lot at Costco every time you power up, you should at least give fair warning. Even if you don’t have a jet. Buy through eBay at http://www.ebay.com/itm/231228026135?item=231228026135&viewitem&vxp=mtr. $20 each plus $4.00 shipping for the first decal and $2.50 shipping for each additional decal. More descriptive information is available at the eBay listing. Airspeed and Acro Camp -Logo Shirts, Caps, and Other Items. Show the world that you’re an Airspeed fan with a broad range of high-quality shirts, caps, and other items. Head to http://airspeed.qbstores.com to see the Airspeed Apparel Store.